The second new job to be added in this year's expansion. We told you everything we knew about Final Fantasy 14's upcoming Stormblood expansion, but one thing we didn't know at the time was the nature of its second new job. Oh you'll be able to don your finest crimson garb and gad about as a Red Mage (they can use white and black magic, meaning they should really be called Grey Mages), but what else? 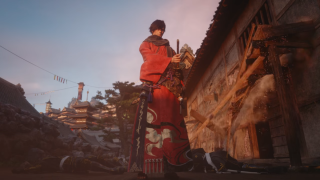 I'll tell you what else, because Square Enix has just announced it: the second and final job to be added as part of Stormblood is...the Samurai, who sounds pretty damned cool if you ask me. If you decide to be a Samurai, your primary weapon will be the katana, which you'll use in conjunction with its saya (or scabbard). With no base class, samurai will start at level 50; they'll also use the same armour as monks, if you have any of that lying about. The new job was announced at Frankfurt's Final Fantasy XIV FanFest keynote, which also revealed that Stormblood will introduce a new continent to the far east (presumably the home of the samurai). There'll be a new player city, too: Kugane, with a style that recalls ancient Japan.